Damascus steel: centuries-old, hot-forged steel that is legendary for making sharp, strong blades that struck fear in many a man’s heart. Artisans, blacksmiths, and hobbyists the world over have initiated a renaissance of this fascinating, decorative material, which is the focus of this comprehensive book. Unravel the history and mysteries surrounding various types of Damascus steel before delving into the theory and mechanics of forging your own complex Damascus steel creations. 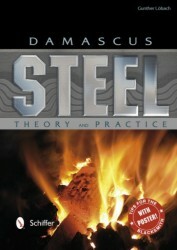 Use the detailed, computer-generated illustrations and hundreds of photos to learn how to forge-weld your Damascus steel billets, properly execute torsion technique, and see the endless potential for forging patterns in Damascus steel. Complete with material and equipment requirements, safety precautions, practical tips, temperature charts, and examples of finished works, this book offers inspiration and the fundamentals of working in this ancient medium. Ideal for amateur blacksmiths and experienced metalworkers. Includes a bonus poster, "Practical Tips for the Blacksmith."